What’s better than seeing kids deeply engaged in learning skills that’ll enrich them for a lifetime? Baking is just such a skill. But with so many activity options in school and out, why bake? Sofia Votava, an Orange Co. 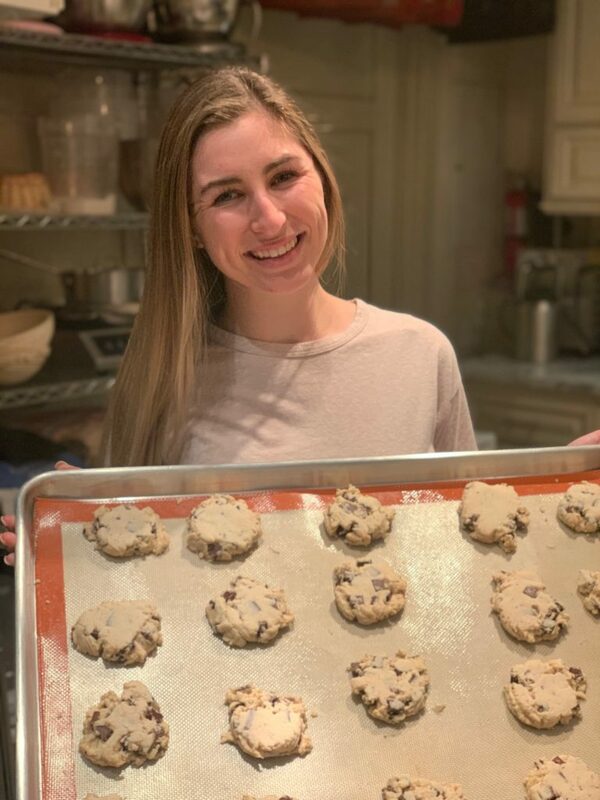 Girl Scout, shares how, and why, she and her family got started baking together. 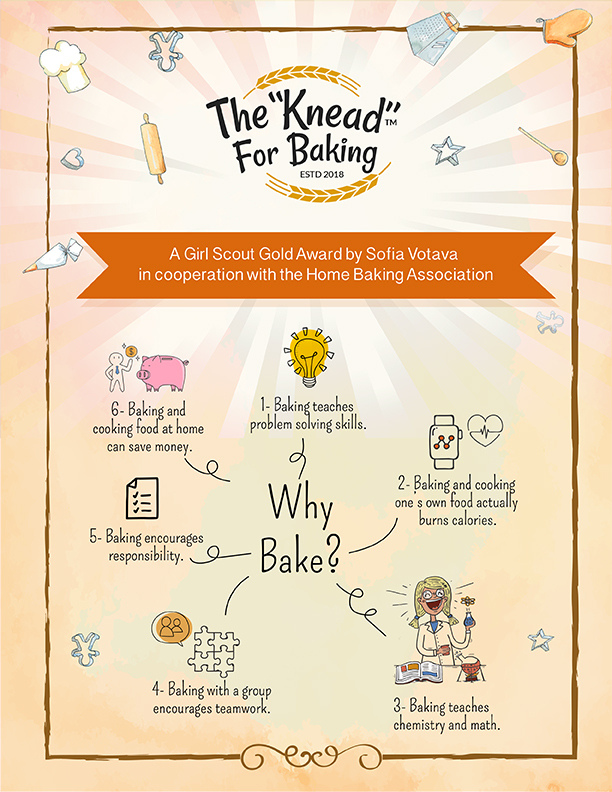 Stay tuned through out February to learn more about how their baking start up became a special baking outreach through Sofia’s Girl Scout Gold Award program, The Knead for Baking. “Growing up as a competitive dancer meant I spent over 20 hours weekly at the dance studio. It also meant I never saw my mom make me dinner, let alone bake. My brother and I were accustomed to eating on the go, since the dinner hour fell right in the middle of my dance classes and my brother’s basketball practices. “From scratch” was a foreign concept to me until I was in middle school. After my mom got remarried to my step-dad Vic, our lives changed in more ways than one. One weekend, I had a to make a dessert for my 5th grade holiday party. That’s when Vic’s secret came out! He had been a pastry chef as his first career. I’ll never forget the feeling of baking with him for the first time. 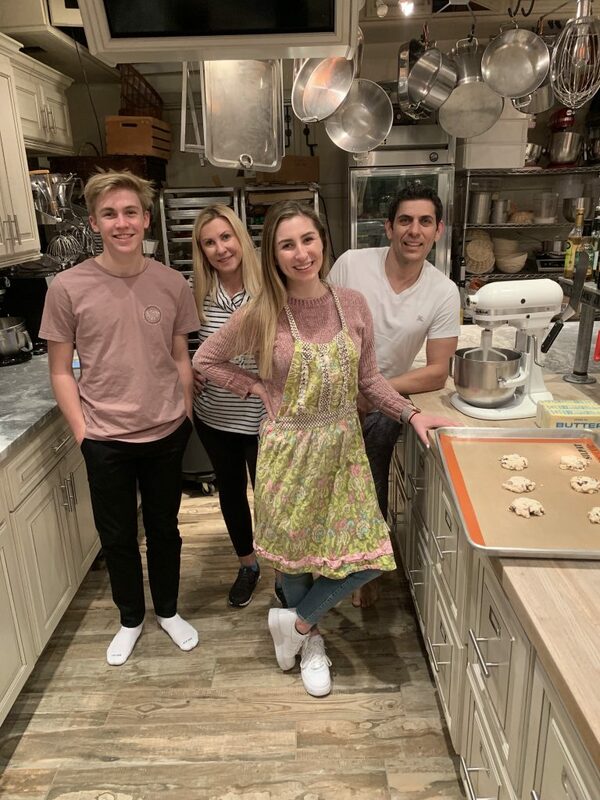 This bonding moment inspired Vic to start baking again and our entire family joined in the fun. Before we knew it, we were baking as a family every weekend. Vic first taught us the basics: measuring ingredients, multiplying recipes, and even cracking the eggs. As a family, we made it our mission to spend quality time together in the kitchen. My favorite memories with my family happen to be while we were baking together. Access Baking Food Safety 101 and many more “helps” to Get Started baking at the Home Baking Association. Looking for ways to de-compress at home after what some say has been one of the most stressful years they can remember? Wishing your children could gain hands-on science and math that’s essential in life? Baking is just such a science and life skill. The beauty of building your baking skills is that it’s good for de-stressing and mental health. “Baking is mindful,” says Philip Muskin, a Columbia University psychiatry professor and the secretary of the American Psychiatry Association. Muskin says it can have an emotional impact akin to practices that are intended to more directly affect mood, such as meditation or breathing exercises, reports Amanda Mull in her article The Rise of Anxiety Baking, a December 18, 2018 HEALTH feature in The Atlantic magazine. Baking takes you from virtual to actual, something increasingly difficult for all of us. According to researchers from the U. of Pittsburgh School of Medicine, in a UPI.com December 20, 2018 release, people in the top 25% of social media use have significantly higher odds of depression—1.7 to 2.7 times the risk. 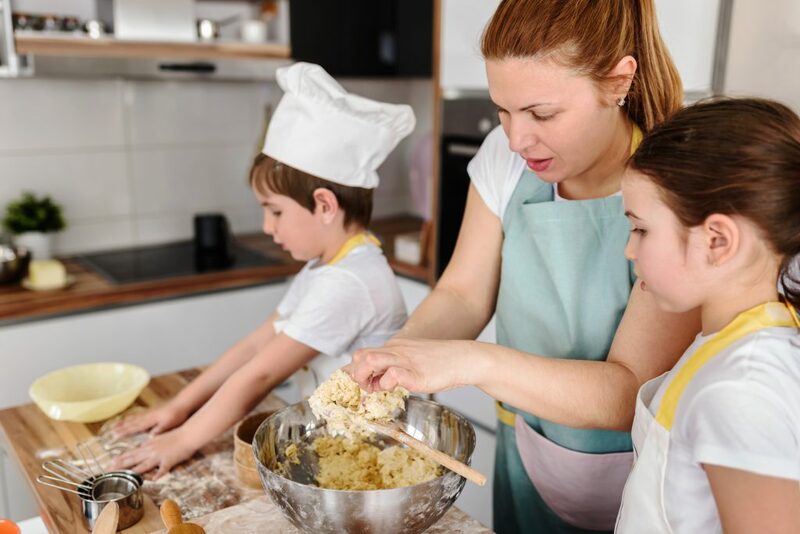 Baking requires you and your children to put down your phone, read a recipe, organize ingredients and equipment, get your hands actively engaged and the task your total attention if you want success. It builds true self-esteem when you contribute to family meals, celebrations or share with a neighbor or the community what you produce. Why not spend some time, beginning now, baking something each week in 2019? Start simple! Launch traditions! Bake for those you love or your community. 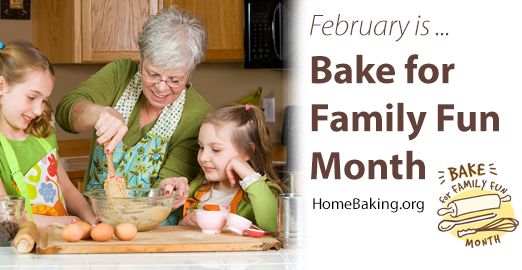 Join other bakers in February for “Bake for Family Fun” and share what you prepare. Find great visuals, guides and recipes at the Home Baking Association website. Bread home bakers and bloggers, age 18 or older at this time, from all over the U.S. are entering the National Festival of Breads. Have you considered it? The entry deadline is January 22, so gather your favorite bread ingredients and enter the recipe. 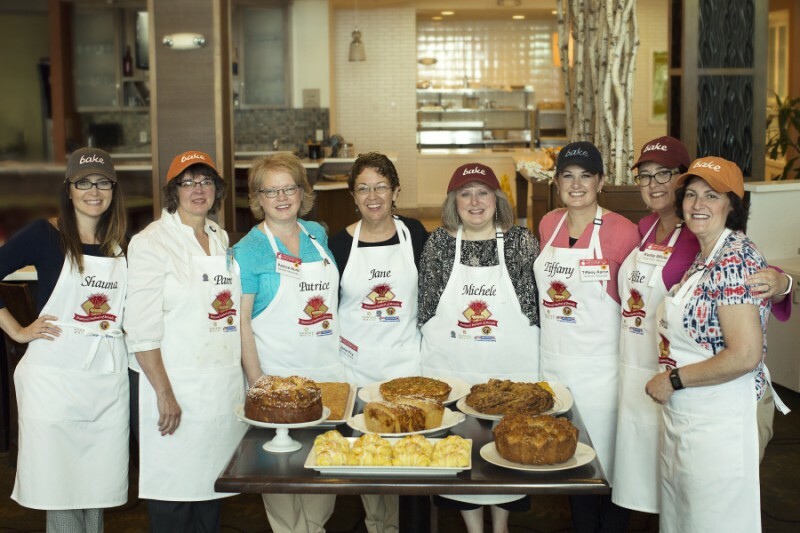 We hope you’ll be selected to compete with five others here in the heartland of wheat, milling and bread baking where you’ll receive a Heartland welcome and events to boost your baking knowledge and enjoyment while you compete. Not one to compete? Join the hundreds of baking enthusiasts, benefactors and educators who’ll make the trek for the day to attend baking demonstrations, “Ask the Baker” baking STEAM sessions, exhibits and view the six competing bakers as they produce their entries for the judges. 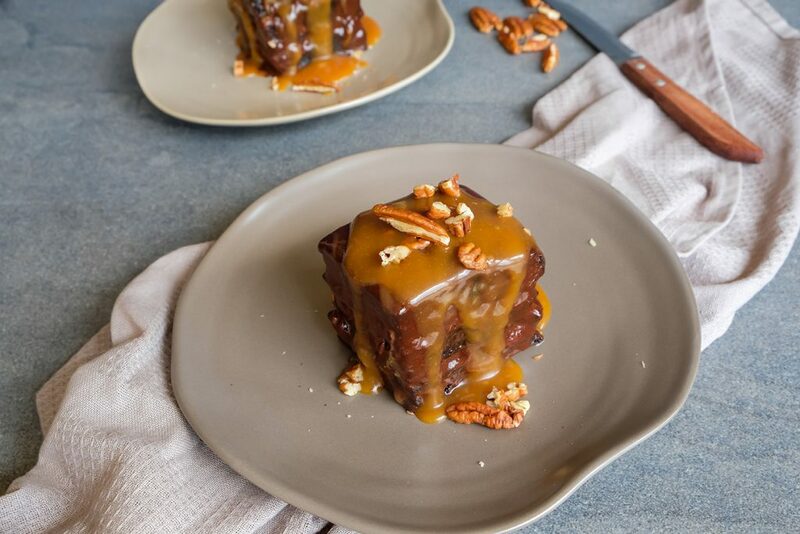 Plan to travel to Manhattan, KS and check this one off your baking bucket list in 2019! The Sugar Association and Home Baking Association have joined together to celebrate the holiday season by helping you turn your kitchen into a wonderland of fun! Everyday pantry ingredients like flour, sugar, and spices can become a magically delicious world that the Sugar Plum Fairy herself would love. Holidays are the perfect time to gather together in the kitchen for some family baking fun! 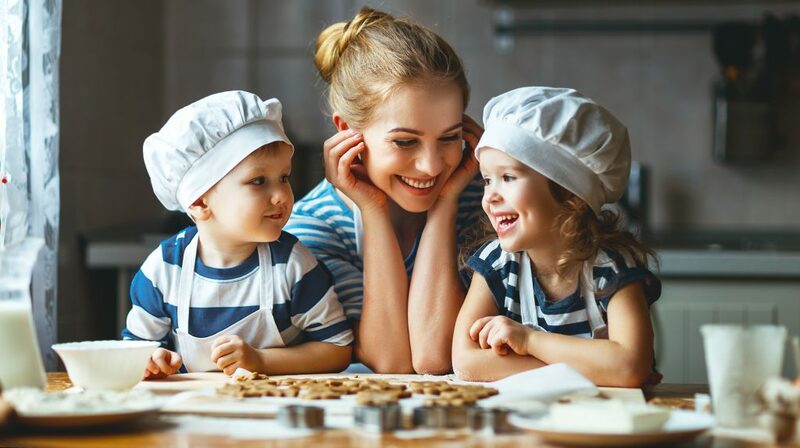 With the Home Baking Association’s handy baking skills guideline Thrill of Skill, family members of all ages can get into the action – from age two and up. Remember to always start with washing hands. Encourage young bakers to begin baking using six simple baking food safety steps. Baking Food Safety 101 provides the steps, including a checklist, and an internal temperature guide for doneness. Let older children help younger kids to measure, stir, and of course clean-up! Parents can use the Ten Tips for Baking Success guide to help get organized before the baking begins. 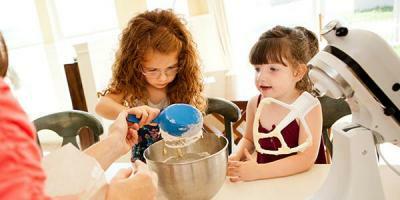 From gathering ingredients and equipment to allowing extra time when baking with children. Tis also the season for sharing. Remember to make some extra goodies and let family members deliver baked treats to neighbors, teachers, or community programs. Get everyone involved and decide what to bake and where to share. Baking together is a wonderful way for the entire family to contribute to the community. From savory to sweet, the Home Baking Association is a wonderful resource for recipes the whole family can make together. 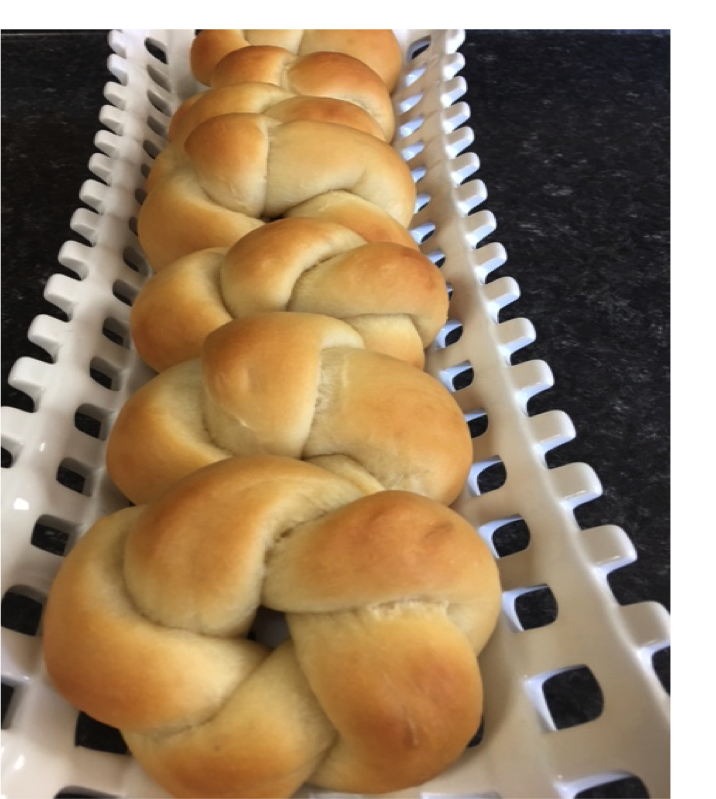 Refrigerator Potato Dough is perfect for yeast rolls or even to make a beautiful wreath. Dough Sculpting 101 provides the recipe and helpful tips for shaping the edible art and more ideas for holiday fun! Looking for a sweet treat to share? How about a Quilt Cake? Let each family member decorate and create a unique block for the cake. Create this fun dessert to share after playing in the snow or a caroling partyaround the neighborhood. Adding colorful sanding sugar is extra festive and perfect for decorating holiday cookies too. Baking treasured family recipes can become a holiday tradition and a wonderful way to ensure they are passed from one generation to the next. Invite grandparents, aunts, uncles, cousins, or friend to come join the baking festivities. Don’t worry if you haven’t any passed-down recipes – start now and create your own family favorites or learn a new tradition from someone else. To make it even more “rewarding” here’s a printable baking certificate so everyone remembers the family baking fun! With the hustle and bustle of the holidays it doesn’t matter how simple or fancy the baking activity. Spending time together as a family will create memories that last and grow for years to come! The Home Baking Association (HBA) www.homebaking.org mission of “growing the practice of home baking” could not be timelier due to economic conditions and other societal changes. 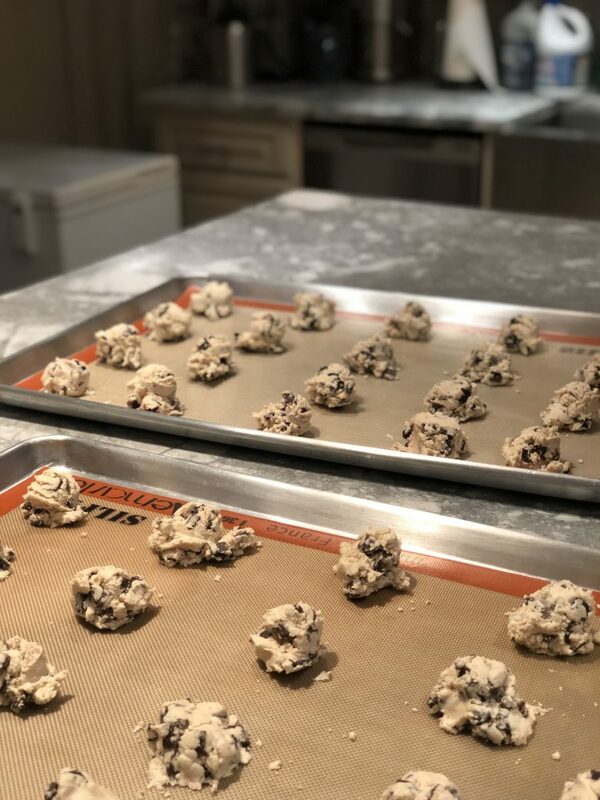 The fact is more meals are being prepared at home, and this organization is at the forefront in sharing our tools and knowledge to not only current bakers, but future generations as well. In recent years, more people learned about HBA than ever before, keeping the momentum of this non-profit organization going strong. (Arlington, VA – December 13, 2018) It’s the most wonderful time of the year again, and the companies that provide consumers and restaurants with flour for their holiday baking needs are reminding everyone to utilize proper food safety practices this holiday season. Flour is made from wheat that is grown in nature on farms and minimally processed prior to packaging. Proper handling and baking of flour, dough and batter is essential to eliminate the risk of illness from E. coli, or other pathogens, that may be present in some flour. • Wash your hands thoroughly when you are done. • NAMA’s proper handling and food safety video can be viewed here. • The Home Baking Association, in collaboration with NAMA, developed Baking Food Safety 101, an education guide to safe home baking. “NAMA and its members wish everyone a happy holiday season, with special moments shared with family and friends. The holidays will be even brighter when we bake with our hearts, and our heads, resulting in delicious and safe foods that shape the traditions and memories we hold dear,” concluded McCarthy. NAMA is the trade association of the wheat, corn, oat, and rye milling industries. Member companies operate mills in 38 states, Canada and Puerto Rico, representing more than 90 percent of total industry production capacity. ‘Tis the season for so much that is so good to be shared with so many. We enjoy serving up wonderful meals, gifts and moments. However, with the challenges of finding a healthy balance, focusing on moderation, and tracking down the right ingredients, we all know difficult this can sometimes be during the busy holiday season. Fortunately, when you hold the measuring cup, bowl and knife, it helps. Whether you’re looking for specialty ingredients or an American heritage recipe, many of our members offer helpful guidance and resources. Baking for Special Needs can help with ingredient substitutions too. 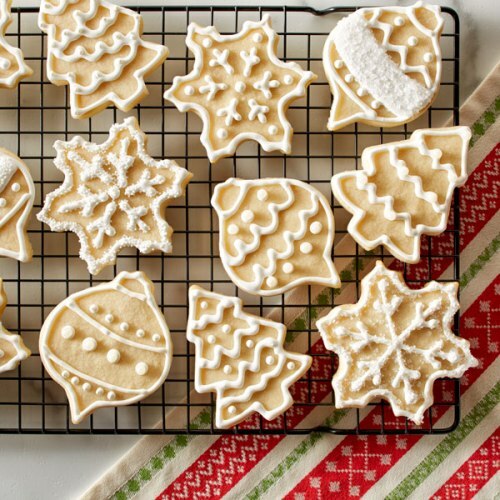 If the loved-one you’re baking for is watching their diet and focused on making it through the holiday season, and the delicious goodies that come with it, without needing a new wardrobe, we suggest embracing wisdom from about 70 years ago—before “mega-sizing” cookies, muffins, and cakes was typical. Treats from back then look like “bite-sized” portions today, and that’s exactly what we need. 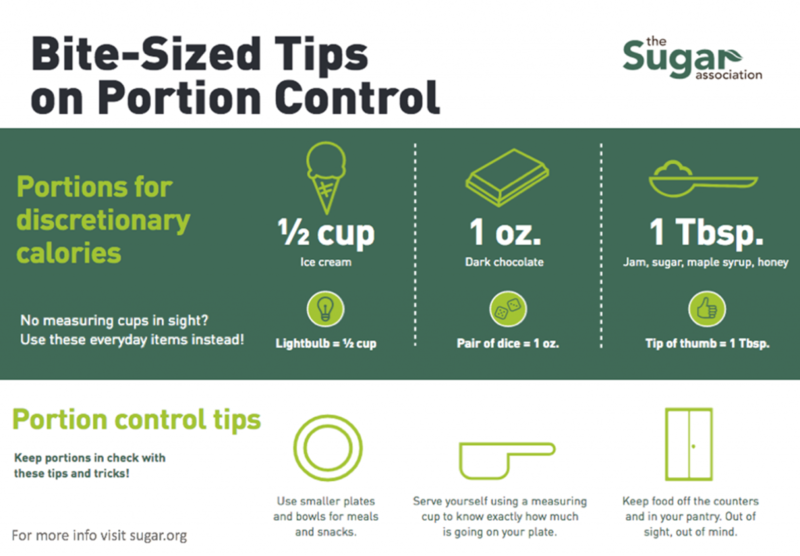 To make this work, you may need to down-size both the portions and the plate. To get in the right mind-set, compare a current dessert plate with one from your great grandmother’s (should you have it handy!). We’ve done it ourselves and the size difference can be a bit startling; today’s dessert plate is about the size of a previous generation’s salad plate. Those smaller dessert plates is why your grandmother could cut a 9 X 13-inch cake to serve 24 or more. Today it’s more likely to be cut to serve 16. Another way to achieve a “bite-sized” goal is to create a Charcuterie Board from favorite home made crackers, crisp flat breads , meats, cheeses and olives. 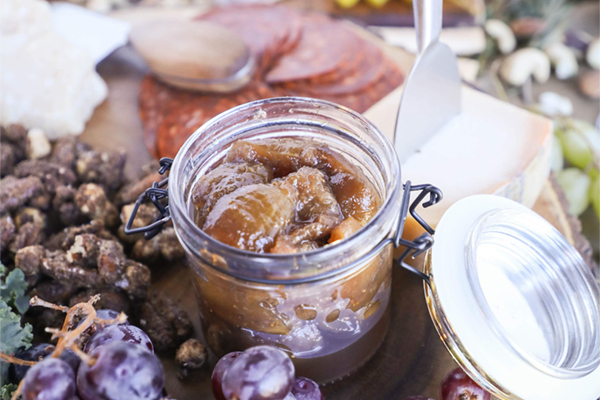 Delight taste buds by preparing Fresh Fig Preserves or a Brown Sugar Mustard. Add to your brown sugar knowledge with a baker’s ingredient guide. 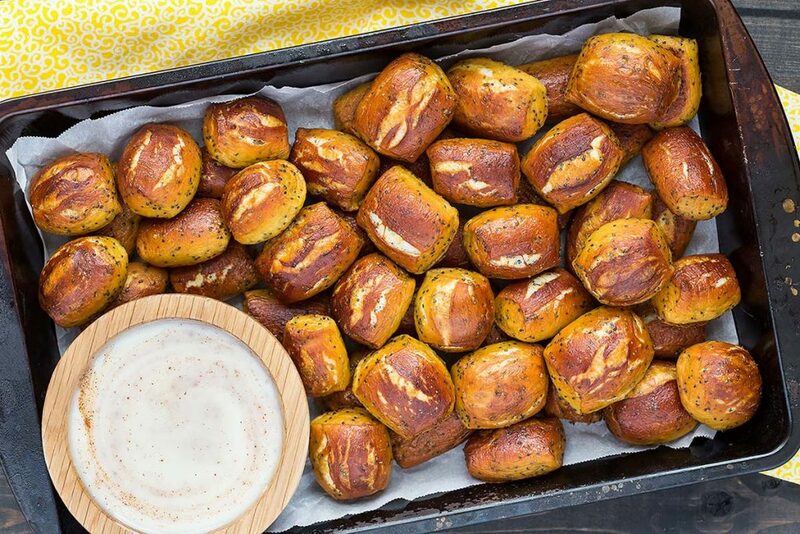 For the bread basket, consider Pretzel Bites—so many options are available! Tarts or “tartlets” are a great way to go savory and bite-sized too. Jiffy Ham and Cheese Tarts or Cranberry Walnut Tartlets tucked on a festive tray or boxed make a perfect gift. By going “bite-sized,” you’ll love the delight of friends and family enjoying a taste of several options without the January consequences! The Annual Family & Consumer Sciences (FCS) Day, “Dining In” for Healthy Families campaign is just around the corner–Monday, Dec. 3rd! As a member of an organization in the Family & Consumer Science profession, which leads advocacy efforts for the field, your involvement is needed! FCS Day is an opportunity to promote family and consumer sciences programs, and resources that support family mealtime. Families are asked to commit to making and eating a healthy meal together on December 3rd – the birthday of AAFCS founder, Ellen Swallow Richards, first woman graduate of MIT. For purposes of the campaign, AAFCS is defining family very loosely–relatives, neighbors, co-workers, community members, or fellow members of an organization! Since 2014, more than 400,000 commitments have been made to “dining in” on Family & Consumer Sciences Day. In 2018, the goal is to add 200,000 “Dining In” commitments. To reach the goal of 200,000 commitments to “Dining In,” your outreach efforts are critical. Commit to “Dining In” on Dec. 3! Change your Facebook profile photo to the I‘m “Dining In” logo. Check out the Home Baking Association resources available here! Ask the people you serve, as well as your friends, family, neighbors, co-workers and professional networks to “Dine In” on Dec. 3. Add the Family & Consumer Sciences Day logo to your email signature. Approach your local and state government officials to declare December 3rd as Family and Consumer Sciences Day using this Proclamation template. Please keep in mind that if you can’t celebrate FCS Day on December 3rd, it’s okay. The date is flexible – “dining in” most anytime between now and December 15th counts! In fact, if you initiated family mealtime programs any time in the 2018 calendar year, you can retroactively make that commitment using the same form. For more ideas on promoting FCS Day in your business, school, or community, please take a look at suggested ideas on the FCS Day website. Thank you for supporting this important initiative! TOGETHER, we are stronger … as the “go to” professionals for education related to essential life skills. I’ll keep this short to allow you time to bake what is one of the tried-and-true breads of my life—Pilgrim Bread. The original recipe—splattered and worn—is in my More-with-Less Cookbook by Doris Janzen Longacre. This bread is great baked in small batches for family or nearby neighbors as well as large batches like the hundreds baked to raise funds for refugee needs in El Paso. Very soon it will be baked by 200 “pilgrim” teens in Atlanta attending their 4-H Congress. We’ll “Share the Wealth” baking brings to life and give half to the Atlanta Food Pantry. Dictionary.com defines a pilgrim as “a person who journeys, especially a long distance, (often) to some sacred place; a traveler or wanderer, especially in a foreign place.” This sums up most of our experiences, starting with personal family trees and onward to this time of year when we share what is sacred time with friends, families, faith groups and communities. I hope you’ll carve out time to bake this bread that combines three nourishing ancient grains, a little leaven, brown sugar, water, oil and salt. Feel free to slow down the process with cooler water and regular active dry yeast. If this bread is too sweet for your tastes, simple decrease the sugar. 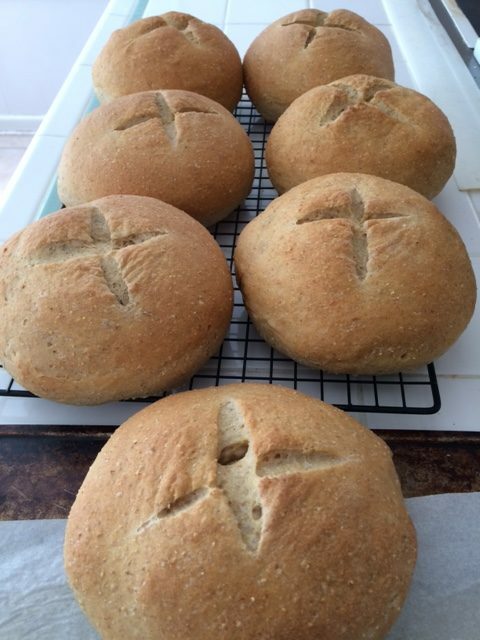 Pilgrim Bread Makes 16 buns, four small round loaves or two large loaves. Directions Tie back hair, remove jewelry, wash hands, put on apron. In large mixing bowl whisk very hot water and cornmeal to blend. Stir in vegetable oil or shortening. Continue with Step 2. In separate mixing bowl combine yeast, brown sugar, whole wheat flour, sorghum OR rye flour and salt. Mix well. Add cold water to cornmeal mixture; take a temperature to be sure it’s cooled to 130°F. Stir in the flour and yeast mixture. Stirring vigorously, adding 1/2 cup at a time, mix in 1½ cups bread flour. Stir about 3 minutes, until rough dough ball forms. Measure last 1 cup bread flour. Scrape out mixing bowl, turning dough onto clean kneading surface, or add dough hook to mixer to develop dough. Sprinkle the dough with about ¼ cup flour. Knead in the bowl or on the mat/counter for 1-2 minutes. Repeat with ¼ cup more flour, kneading another minute. Repeat 2 times more. Dough should become smooth and elastic. If dough is very sticky, sprinkle with another 2 T. flour and knead again. Stir/knead/mix 5 – 10 minutes. Turn bowl over dough. Let rest at least 10 minutes. Meanwhile, wash hands, counter, line or oil sheet pan; sprinkle pan with cornmeal. Gently weigh dough. Divide dough in equal halves to form into two large loaves, or equal fourths for four small loaves or into 16 buns. Stagger or space loaves and buns at least 2-inches apart. Cover lightly or proof about 20-30 minutes (loaves double in size)— a 105°F draft-free place is great. Preheat oven to 375°F. Slash loaves in center top (about ¼-inch deep). Bake 25-30 minutes, until 190°-200°F. at center of loaf. Cool bread on wire racks until 100°F. at center before slicing or packaging. Wash counters, utensils and hands before handling baked bread. Store bread at 70°-95°F.—do not refrigerate bread–freeze bread if not eaten in 1 day. 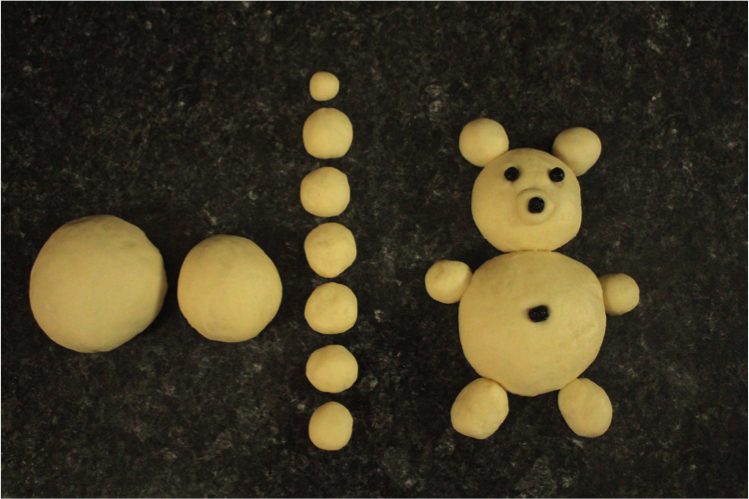 With seasonal décor flooding the stores, do you ever imagine sculpting your own decorations from bread dough? 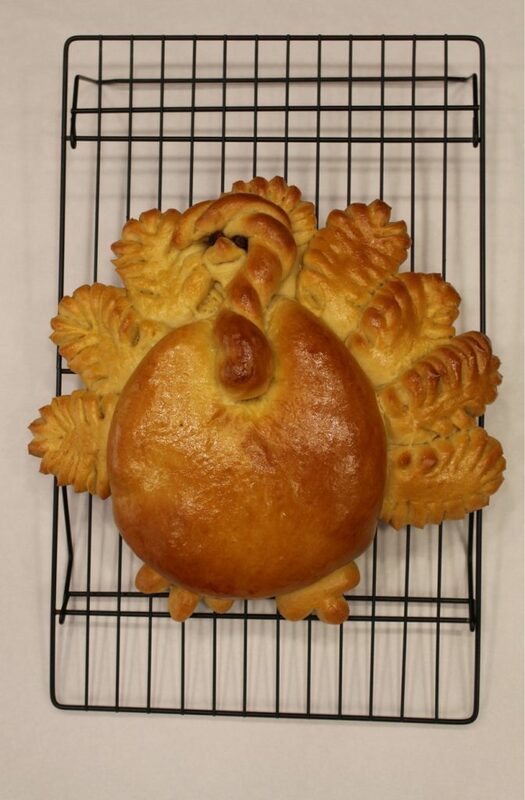 For ideas on how to accomplish this, the 2018 Kansas Wheat Commission recipe book features over thirty bread sculptures. 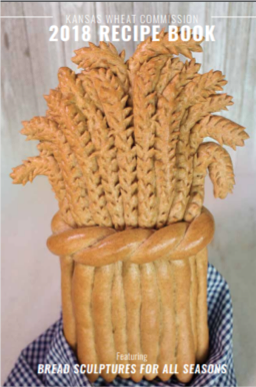 Falk organized the inaugural Kansas State Fair Bread Sculpture contest and registered over thirty entries. 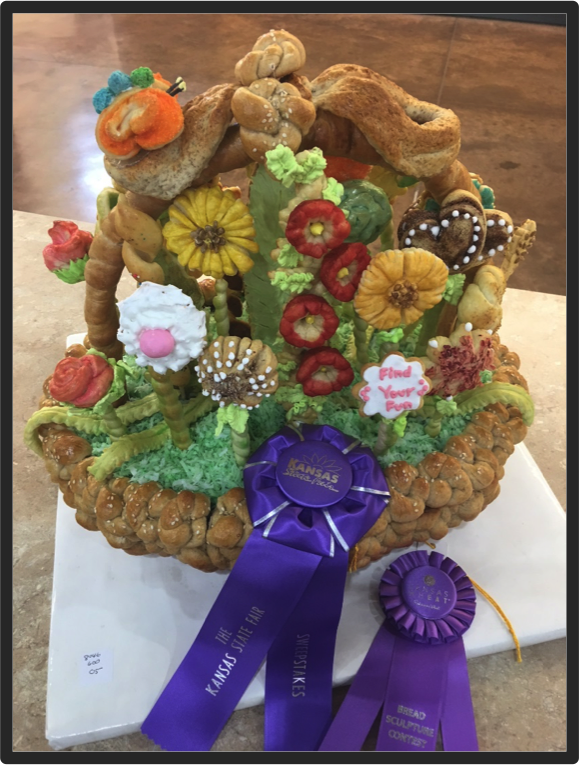 An ornate, woven bread basket filled with colorful, painted flowers was awarded the grand champion prize. Long before the 2018 fair, Cindy along with her assistant Julene DeRouchey, sculpted, styled and photographed dozens of creative bread shapes. The results? We can all now roll up our sleeves and prepare a simple white or whole wheat dough for sculpting anything from bees to fishes…to spiders to witches. Each season showcases six to 10 creations to set apart every gathering. For example, learn how to sculpt centerpieces like a stunning, golden Sunflower, a cluster of rustic Harvest Grapes, and all-time favorite Tom Turkey. Guests will be delighted to find their place at the dinner table with their very own filled mini-cornucopia. 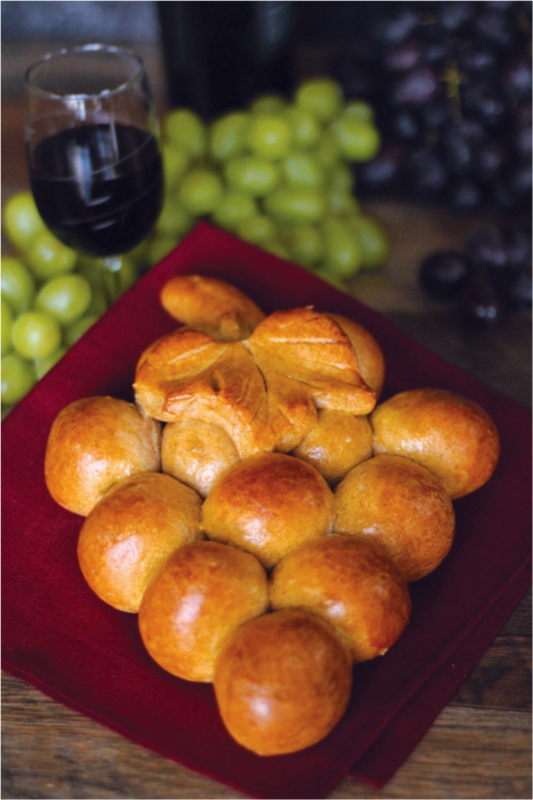 They can also enjoy a bountiful bread basket overflowing with rosettes, rose blossoms, and sweetheart cinnamon rolls. 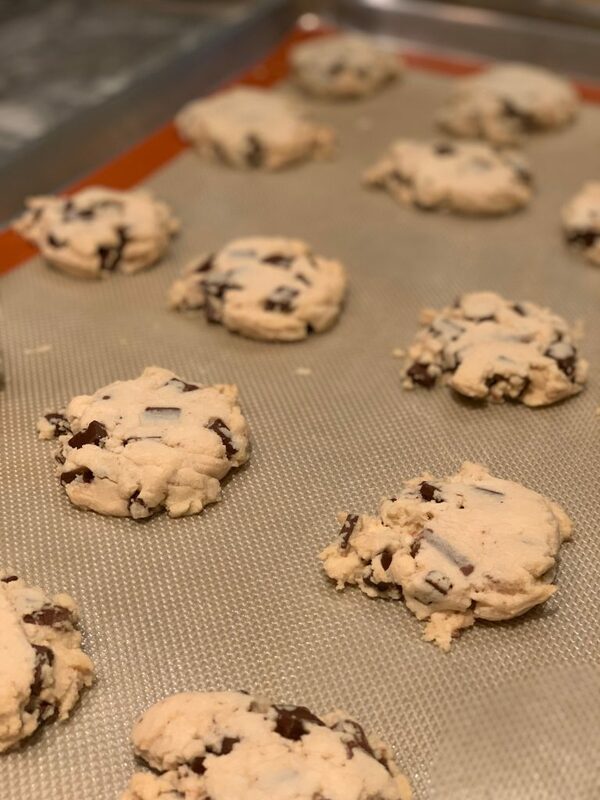 If you’re a culinary or FCS teacher, learning the skill to bake these value-added products helps achieve 20+ Family and Consumer Sciences standards, builds Career and Tech skills, is STEM + Art (STEAM) and applies Baking Food Safety.